The automatic upload synchronizes existing camera photos by the first launch of the app. After that, new camera photos will be synchronized when you take them. 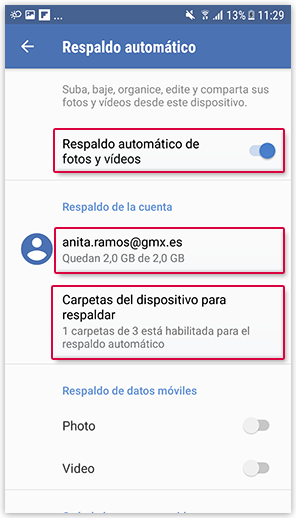 This means that the backup happens automatically in the background, even if your GMX File Storage App for Android is not active. To protect your mobile data, we only recommend synchronizing when you are using Wifi. Under General, tap Automatic upload for photos and videos. Turn on the automatic upload for photos and videos. 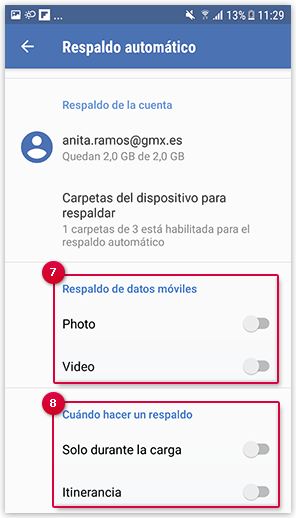 If you are using the GMX File Storage App for Android with multiple accounts, choose the appropriate account for which you want to activate the automatic upload. To choose the folders on your device that you want to synchronize, tap and choose the appropriate folders. Under Cellular data backup, choose if you want to backup photos and videos while you are using mobile data. Under When to backup, choose if you want to backup only while charging and if you are on roaming. Roaming means that you are using a mobile data network in a foreign country, so costs for your mobile internet connection could be higher than normal. If you take pictures with your phone camera, they are synchronized with your File Storage. The uploaded photos can be found in the folder Camera uploads. The folder contains subfolders that are divided by months.